I'm getting really tired of plastic bags, they are horrible for the environment, and while I am far from becoming obsessed with saving the planet, I think that this is a first step I could take. 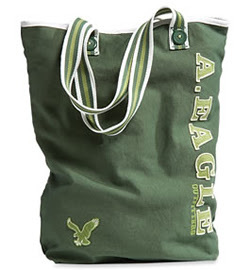 The problem with "green bags", is that most of the time they are not the most fashionable bags out there. So how do you save the planet and look good while doing it? It doesn't have to be a "green" bag. It doesn't have to be organic. 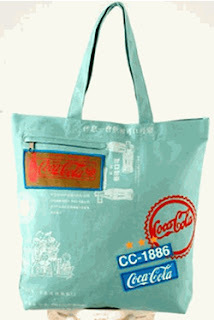 As long as you keep reusing the same bag, you are doing your part in saving the environment. It shouldn't be expensive. Considering you will store garlic and onions in it, it would be silly to ruin an expensive bag for groceries. 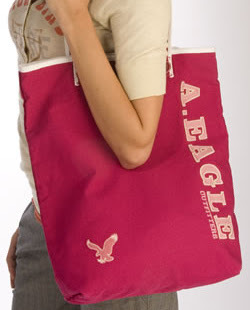 American Eagle Tote, available in different colors. 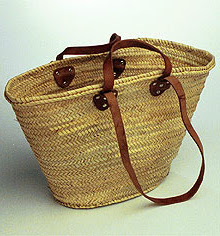 For something different, how about a French Shopping Basket? 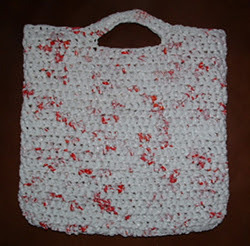 But the best option, if you can crochet, is to make your own grocery tote with yarn made out of cut up plastic bags, referred to as "plarn", very interesting! 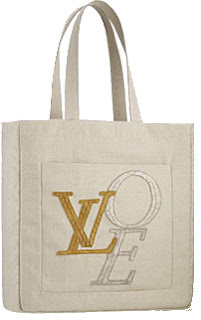 The Louis Vuitton LoVe Tote! "You can’t spell the word LOVE without the letters "LV"
Hey Marc! I have another word that you can't spell without LV: LucratiVe! I have found a stunning, eco-friendly tote at the following site - http://www.oneracehuman.org. You can make a statement while carrying your groceries. I just ordered two!! and check out the bags at www.minusbags.com. Very cute, functional and made in the US! I got mine at -http://www.thegreatbag.com Eco-friendly and made in the USA. They are so cute and very well made. I have actually been remembering to bring mine with me all the time (I'm kinda proud of myself! )I used to forget and then I would feel guilty. Now I carry one with me and I keep the other in the trunk of the car. My favorite reusable bag is a $5.00 Bag For Life from the Body Shop at Home. #34189(13 1/2 x 15 3/4")www.thebodyshopathome.com/web/debireynolds 40% of each bag goes to the National Coalition Against Domestic Violence! So you help child worldwide & protect the planet each time you use the strong canvas bag! Proceeds have also built a school & hospital for 300 children in India. Shop & be proud to carry this bag & share this idea with others! Thankyou! I hate plastic bags, too. I think that carrying a cloth bag is one of the easiest ways to help the environment. Cloth grocery bags are the new fashion, and plastic is so last year! Check out my bags, they are fashionable, cheap, and I make them from material that would have found it's way to the landfill.